I honestly didn’t forget Mother’s Day. I just thought that it was next Sunday. I didn’t see last week’s Sunday paper, I don’t watch TV (at least, not on the television set), I don’t pay any attention to ads, and I’ve been so spacy that if anyone has talked about it in front of me I guess I missed it. I’ve always associated it with the same weekend as graduation. 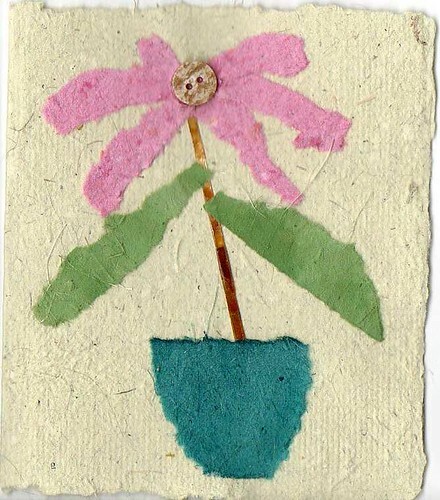 Anyway, I made this card for Mama out of my handmade paper, mica, and a button. Hope that she will forgive me.